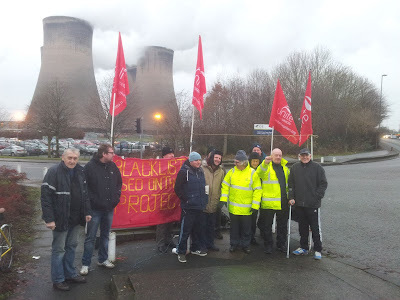 I joined a protest today at Fiddlers Ferry power station marking five years that Steve Acheson has been protesting there. Steve is one of many activists in the construction in industry who have been sacked and blacklisted by employers - despite this being illegal. Steve has played a crucial role in exposing blacklisting, a campaign that has made real headway recently. The electricians' successful campaign against the attempt by major contractors to impose the BESNA deal increased the visibility of the issue, particularly because of the key role blacklisted workers played in the campaign. Steve's tenacity in protesting for five years has been matched by relentless efforts by Steve and others to use legal action to obtain vital information about this shady world. Kerr declined to give evidence publicly about certain topics relating to the security services, and was due to give evidence on that in private, but he died before he did.